Okay, I have been absolutely appalling at keeping up with blogging this week. I'm sorry! I have not replied to any of the comments I've received since last Sunday and I've not really been commenting on other people's blogs either. It's just that it's starting to get near the end of term here and I always feel a little out of breath during this time, like there's still so much work left to do, and I want to hang out with my friends here as much as possible before term ends, and I'll have to pack all my stuff. And then after term ends I'm going to Scotland with my dad for a week before coming back down to Oxford for a ball and then I'm flying back to Hong Kong two days after that. Um. Yeah. SO MUCH STUFF IS HAPPENING. I will probably continue to be terrible at blogging for maybe the next two weeks. Miranda @ Tempest Books confesses that her boyfriend doesn't like to read and asks whether your ideal partner would love reading. Kayla @ The Thousand Lives wants to know: to reread or not to reread? We're halfway through Mental Health Awareness Month and Leah @ Uncorked Thoughts has a Guess the Cover game! Guess the covers of 10 books to do with mental health to enter the giveaway. The Witch of Salt & Storm by Kendall Kulper: Also known as Salt & Storm in the US, so I'm using that cover since we haven't got a UK cover yet. That's it from me this week! I haven't bought any books this week since, like I've said, I've got a lot on my plate at the moment. How has your week been? Feel free to link me to your recaps/hauls! Wow...it sounds like you are going to be busy soon. I'd love to go to Scotland. That sounds like so much fun. I hope you enjoy your new book! Busy, busy, sounds like a lot of fun. Enjoy your week and Salt & Storm. Sounds like your week was a lot of fun. Salt and Storm sounds very good and interesting. Come check out my stack as well. Wow you have been busy :) I haven't been to the movies in a rather long time at least to see a movie that I wanted to see. I go now for the kids. 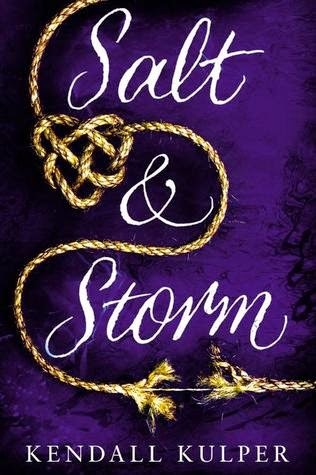 Ooooh, Salt & Storm, I'm waiting to see if I'll be approved for it on NetGalley, it sounds fantastic! Best of luck in the last stretch of the term! I always seem to be behind in commenting, so I understand how you feel. It's totally okay to get a little behind when you're so busy. :) As for the book, Salt & Stone looks really good! Hopefully, you love it! ooh salt and storm! Awesome!! I really want to see maleficent. I have heard amazing things about it. Woah, busy busy! :) I've heard of The Witch of Salt and Storm, but don't know much about it. Happy reading! Scotland is lovely! I've already been before. So nice. Also lots of nice seafood to eat. ANGELINA JOLIE'S CHEEKBONES, YES. She was so good! Her acting was just heartbreaking and amazing. Loved the story so much too.